As always seems to be the case, I started working on my own version of a unit, then GW go and reveal a much nicer updated version of it! Granted they might need a rebasing when the new kit launches, but other than that, i'm pretty happy with them. I think the garish colours actually make them look pretty disturbing. I'm not sure what I'll be doing next. I might paint another unit for my EC's or Deamons whilst I wait for Shadowspear to launch, or I might crack on with that other project I've been hinting at for a while. I'll have to see where the inspiration takes me I think. I've got a few days off work now, so I'm likely to be getting quite a bit done! I've been pretty busy over the last couple of days. I've decided to push on with my quicker method for doing my Deamonettes, mostly because I want a chance of being able to game with my Daemons force at some point in the foreseeable future. I surprised even myself a little with how much I've gotten done though! That's 30 Deamonettes finished over two night's worth of hobby sessions. Not bad at all and I'm pretty pleased with how they turned out. I'm so happy in fact that I'm actually considering leaving them as they are rather than going back later and improving on them later. I also got a couple of Heralds finished too. I decided to give these the full treatment on their paint jobs, seeing as they're characters. These actually came together really quickly, both in one sitting. I think it's down to them being such lovely sculpts. The Enrapturess in particular was a joy to paint, even though she was an absolute arse to put together. Hopefully the mere fact of her existence means that Slaanesh is going to be getting some love soon too. It was only a few odds and ends that needed doing, but it's still nice to have them done. The Ultra Violets have had mixed start to the campaign, winning one game easily and losing the other quite heavily. I somewhat underestimated the power of Cawdor and their massed flamers! I managed to crawl away with no lasting injuries though, so that's always a bonus. Next time I'll be facing them on an open field rather than Zone Mortalis though, so hopefully I can get some revenge! All in all I'd say that I've made a healthy amount of hobby progress in the past few weeks. By my count I've netted 62 points of positive progress, inching my closer to my goal of positive figures. Hopefully I can keep this flow of progress going, as I've got my eyes on an upcoming project that's going to knock quite a big chunk out of that. More on that later. For now I want to knock out a few more Slaanesh models before I get too distracted by other things. As I talked about in my New Year post, my goal for this year is to only play games with painted models. That's a great goal to aim for, but it's thrown up an unexpected quandry, which I want to talk about today. My mantra when painting over the past couple of years has been to 'up my game' wherever I can. I used to be able to churn out entire armies in no time at all, but quite frankly in hindsight, they looked like garbage. I've been making a real effort to change that recently and have been trying to really improve my painting skills. Without tooting my own horn too much, I think it's been working well for the most part. I'm certainly a lot prouder of what I've produced of late and I've had comments from several people about how much I've improved as well. They look great in my opinion and are exactly how I want the entire army to eventually end up looking like. 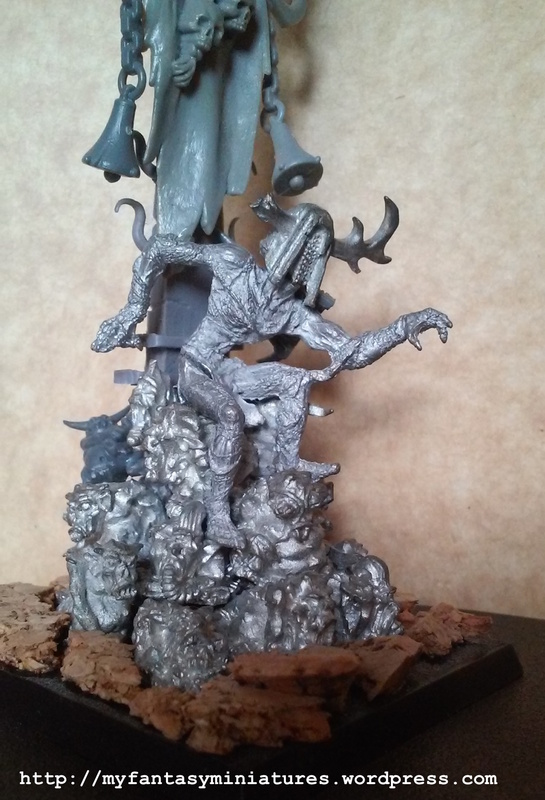 the problem is though, these five models took two or three hours to get to this stage and I need fifty of them just to make my Daemon army playable. Granted these aren't finished yet, but these took roughly an hour to get to this stage, painting mostly with washe. That's a fraction of the time it took me to do the first five, but they still look pretty decent in my opinion. They still need another layer of wash on their claws, but they're fairly close to being done. They look good as a collective group, but they're nowhere near as high quality. I'd consider them a mid-level tabletop standard. The question I'm finding myself asking is, do I want to compromise on the overall standard of painting to help clear my backlog quickly and be able to play games with my Daemons, or do I take the time to bring them all up to a higher level? I'm sure it's a question we've all found ourselves asking ourselves from time to time, hence why I decided to make a post about it, so I can hear other people's thoughts on the matter. I'm going to think this over for the next couple for days, but I'm currently leaning towards mass producing them. I can always return later and 'top them up'. Getting a shift on with my rate of finished models seems a really solid idea, especially with new projects on the horizon calling to me already. Once again I haven't posted up here for a while. One of my New Year's Resolutions is to get back into the habit of blogging again on a regular basis, so hopefully that'll improve. My second resolution is to try and clear my hobby backlog and bring my painting points back into positive figures, as it's getting to quite silly levels again. Easier said than done, but there's not much coming out soon that I'm aware of which could derail me too much. It's also mostly giving myself a little push on projects to finish them off, so shouldn't be too hard. I'm off to a roaring start, I'd say! I've been working on my first Maniple for Legio Mortis on and off ever since Titanicus relaunched back in the summer, but my tendency to be a hobby butterfly meant that I kept getting distracted. The Warhounds alone have been staring at me on my hobby desk for the past two months! In the week or so from since the new year, I've been putting in a little work on them every day and I'm really quite pleased with the results. They're fully done now, save for applying decals, which will be ordered when I get paid. I'm particularly happy because my third resolution for this year is to only play with fully painted models wherever possible. Not only will that help me clear my backlog like I want to, it should also hopefully help me stay focused. Next up will be my Necromunda Eschers, ready for a campaign which is starting up at my local gaming shop in the next couple of weeks. I'm back - with Titans! My levels of hobby productivity has been a bit erratic recently. As a result, I haven't had a chance to post anything up here for ages. It's hardly surprising, considering how manic this summer has been at work. Now the worst of that is over though, I want to try to get back into my 'one hour a night' routine. In my defence, you can't really say no when you can get Primaris Marines for that price! I've never really gotten that excited for Primaris before, but I figure having some for my Deathwatch would be quite useful at some point. Me and a friend are going to be going halves on a subscription, so expect us to be getting into some Kill Team action at some point soon. As if I don't have enough to be getting on with. Both are complete barring some decal work, finishing the bases and gluing on some leg panels, but the decals can wait until Forge World get around to releasing transfer sheets or I order some custom ones. I'm really happy with how they've turned out, but I shudder to think how much work went into these. Easily 15-20 hours of hobby time for each one. I certainly think it's worth it though. I'm really thrilled to see how well they've turned out. You can also see my first batch of House Devine Knights in that shot. I'm planning to do a proper photo shoot of all my Titanicus stuff when I've got the first GM box done, so you can get a closer look at them then. That's all for now. This was really just a post to get the ball rolling on blogging again. I'll fill you in with more detail on what I've been up to with Titanicus over the next couple of weeks. I think I've managed to blow up both my painting points and hobby budget in the most spectacular way possible! Adeptus Titanicus launched last weekend and I bought into it hard. As a result, two Grand Master Editions are currently sitting on my hobby desk, ready to be painted. Having booked the weekend off work, I was able to crack on straight away, spending Saturday building my first Warlord, then Sunday painting it. This was surprisingly easy to build and paint considering the size and complexity of the model. They really are a joy to work with. Most of the remaining work to be done is just finishing up the leg armour, applying decals and magnetising the weapons, which I should hopefully get done this week. Of course the elephant in the room (at least to regular readers of this blog) is how this is going to affect my painting points. Long story short, they've been crushed! Despite not being full-sized models, I'm counting each Titan as a full Lord of War. That's 20 points each. I'm just counting Knights as infantry models, due to their size. Across the two boxes, thats's 92 points in the wrong direction. Needless to say I won't be buying much in the near future (until the Reavers and Warhounds release, that is!). I've been deliberately quite harsh on myself with this in order to make sure each Warlord gets the care and attention they deserve. My excitement for this game should mean that I quickly win back ground though. Wish me luck. Hopefully I'll actually remember to post stuff up as I go along, so watch this space! Something almost unprecedented has happened: I made a hobby plan and actually stuck to it! Yes, I'm as shocked as you are. I decided to add to my Sons of Horus for the first time in about 3 years, painting up some Reavers which I knocked together from my bits box a while back. It's nice to be returning this army. They were my first Heresy army and would probably benefit from a bit of an update to bring them up to the standard of painting which I feel I've achieved in the past few years. I might dig out a few more units and give them a spruce up. Then again, a rather large distraction is on the horizon with Titanicus confirmed to be coming next week, so it's probably best that I don't commit to anything on that front! The weather's finally cooled down here, so my motivation to paint's come rushing back. To celebrate, I finished off a load of models for my Thousand Sons over the weekend! That's a pretty solid chunk of progress. It feels nice to be finally getting on with things, as I was getting pretty antsy with the weather making me unable to hobby. It's become such a habit now to get on with something every day, it feels weird when I can't do anything. This is the major one for me. I've been plugging away at this guy for a little while now, playing with colour schemes and details to the point where it was driving me a little nuts. I'm pretty happy with how he's turned out though. I think if I was to go back and do a little more, I'd probably add some scripture to his parchment, but I'm considering him done for now. I'm pretty eager to get on with other projects, so I'm not wanting to spend too much more time on him. Another model I've had laying around for a while, but in this case I just couldn't be bothered to paint him until now. Once I put paint to model though, he actually came together quite quickly. The tricky part was working out the composition of colours to make him stand out as an Apothecary, as my Thousand Sons scheme uses a lot of ivory and white anyway, so he could easily get lost in the mix. I think I've struck a good balance though. The addition of the symbol for the Order of the Jackel on his right shoulder pad helps too. To be honest, I painted these mostly because I had to. I think everybody gets this from time to time: you come across those sections of your armies that aren't much fun to paint, but you have to get them done so you can game with the fun parts! I don't think you can blame me really. Gun crews aren't the most inspiring things in the world. Sure you can really go to town with them in fantasy or historicals, but I just find the Power Armoured variety really quite boring. At least my Quad Mortars are now WYSIWYG though. I also took the opportunity to add decals to the gun carriages. Nothing fancy, but it ties them into the rest of my force. With everything I've been working on recently, I really should get a group shot of my XVth Legion to show you guys. It's getting to be quite a mighty collection! So what's next, I hear you ask? Well I'm thinking of taking a little break from my Thousand Sons for a while as I wait for some bits and pieces to arrive for the next stage of the army. I'm thinking of working a few Sons of Horus units in the meantime. I'm also waiting on the release of Adeptus Titanicus, which could derail things entirely. I'll have to see what happens and where my hobby muse takes me.